The Barak was registered with FCI in 1965 under the name of Illyrian Hound. In 1973 the name was changed to Bosnian Broken Haired Hound (or Bosnian Coarse Haired Hound), and the breed is called the Barak. The Barak was recognized by the United Kennel Club In 2006. 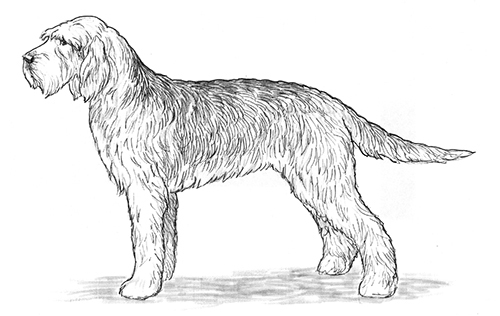 A robust, shaggy haired dog with a coat that is reddish yellow or earthy grey. The skull is medium width, and narrows towards the nose. The forehead is slightly convex, and the occipital protuberance is well pronounced. The stop is moderate. The muzzle is a little longer than the skull. It is rectangular in shape and covered with a bushy moustache and beard. The nasal bridge is straight. The lips are tight and somewhat thick, and are fully pigmented. Disqualification: Lips pink without pigmentation. The Barak has a complete set of evenly spaced, white teeth meeting in a scissors bite. The nose is large, with well developed nostrils. It is black or brown, depending on the color of the coat. The eyes are large, oval in shape, and chestnut brown in color. The expression is intelligent and playful, and the eyerims are fully pigmented. Disqualification: Eyerims pink without pigmentation. Yellow eyes. Wall eyes. Moderately high set, broad, medium long and pendulous, the ears are quite thick and get thinner and rounded towards the end. The neck is arched, and increases in width towards the shoulders. There is no dewlap. The shoulder blade and upper arm are long, sloping and muscular, and meet at an angle of nearly 90 degrees. The legs are straight, strong and muscular. The elbows are close to the body and the pasterns slope slightly. In proportion, the body is slightly longer than tall by approximately 10%. The chest is fairly wide and reaches to the elbow in depth. The withers are moderately pronounced, and the back is broad and muscular. The topline slopes gently towards the croup. The loin is short and muscular and the croup is broad and slightly sloping. The belly is slightly tucked up. The upper thigh is broad and muscular. The lower thigh is long and oblique. The hock joint is strong and the rear pasterns are short and perpendicular to the ground. Cat feet, with well knit toes, hard pads and strong nails. Thick at the base, tapering towards the tip and reaching to the hock in length. Carried in an upward curve. The coat is long, hard, shaggy and tousled, with a dense undercoat. The skin is elastic, tight fitting and well pigmented. Primary color can be wheaten yellow, reddish yellow, earthy grey or blackish. White markings are often found on the head, under the throat, below the neck, on and under the chest, the lower parts of the legs and the tip of the tail. There may be tricolor markings. Disqualification: Any color other than those described in the standard. Ideal height for males is 20.5 inches. Females are slightly smaller. Ideal weight for males is 44 pounds; a little less for females.